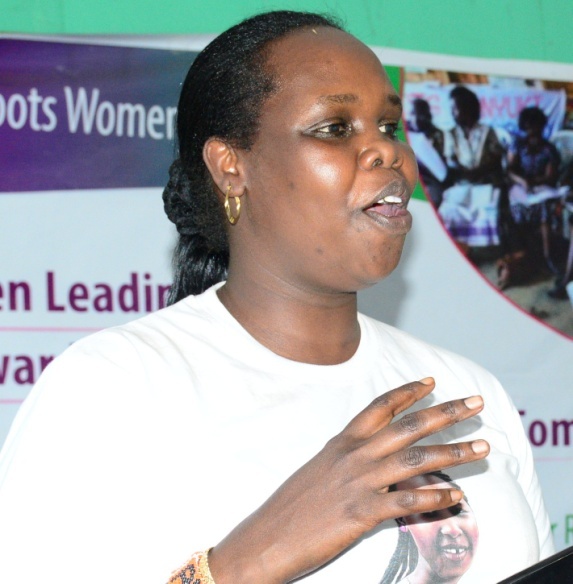 “My name is Anne Naitiku Kiloku, a 42 year old woman leader from Mukogodo East in Laikipia North Subcounty. I joined GROOTS Kenya in 2010 when some women from the organization came to carry out civic education in Laikipia North. It wasn’t until 2013 that I became actively involved in GROOTS Kenya’s affairs after being elected the ward coordinator for Mukogodo East. In 2015, I was awarded Inspirational Woman of the Year in Laikipia County by then Devolution Cabinet Secretary Anne Waiguru and the outgoing Laikipia Governor Joshua Irungu for my work in the Anti Female Genital Mutilation campaign, where I rescued hundreds of girls from facing the cut and mentored school-going Maasai girls. Before joining GROOTS Kenya, I was the assistant coordinator for Enyuata Elosho women organization, a volunteer adult education teacher, and a coordinator for children’s football. Despite this, I still had a difficult time addressing crowds and I only grew out of this fear and became confident when GROOTS Kenya empowered me. I now sit on a land board, a school board and a hospital board. I interviewed for the position of chief for Mukogodo location albeit unsuccessfully but it still shows how much I have grown. After fighting for years to have women included as committee members in group ranches, GROOTS Kenya finally made it happen by empowering women and having men champions who were supportive of women. This is no small feat for women in the Maasai community. I plan to continue fighting for the rights of girls and women in my community.